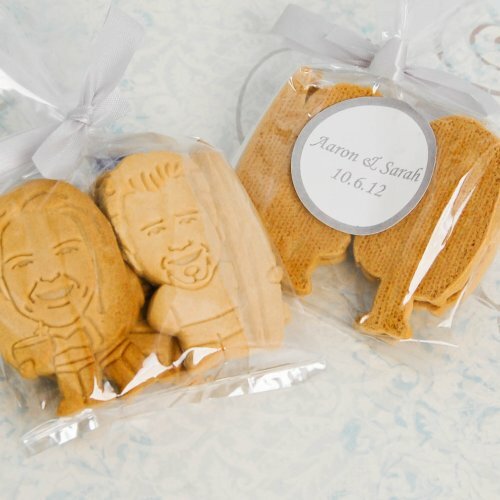 Now I’ve featured pretty wedding cookies and even bride and groom Oreos before, but cookies that are a cartoon version of the happy couple…that’s a new one. I love the idea of sending your guests home with an edible wedding favor. Sure non-edible favors are nice, but sometimes they aren’t useful. But when it comes to food – especially cookies and candy – everyone loves gifts you can eat! These vanilla flavored cookies are designed to look like a caricature of you and your spouse-to-be. All the company needs is a photo of the two of you and they do the rest! The cookies are delivered in bunches of six in clear cellophane bags tied with a ribbon and sealed with a personalized seal. Your guests will definitely love these personalized favors! You can find out more about the cartoon cookies here.